For the last 24 hours, the doctors involved have been stating what has been increasingly obvious to non-believers for days and even weeks now. 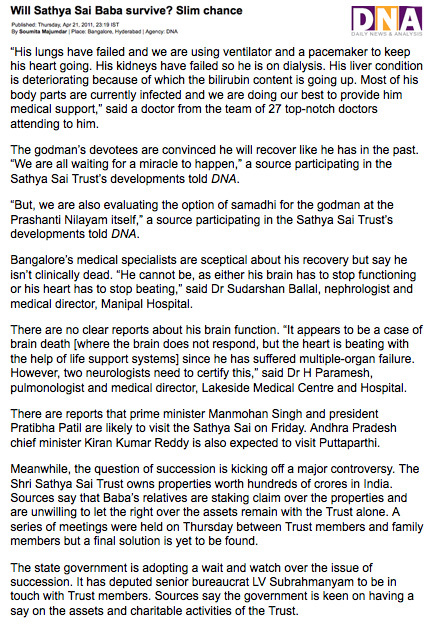 He is near clinical death, some even say he seems to be brain-dead, but neurologists have not been consulted on this. (Why ever not? At this stage!) The big problem is how to dispose of him neatly without seeming to destroy the mythology of his ‘enlightenment’, and how to solve the problem of who will take over as pseudo-successor (i.e. hold the reins of power). This latter problem may well have caused the extreme intensiveness of the care by teams involving dozens or scores of doctors to keep his organs ticking somehow… to get time to fight it out and make all the necessary arrangements (also for a funeral or the heinous living entombment now proposed!). I feel sorry for what remains of Sai Baba and wish him a quick release. Devotees will believe anything on trust, but that trust has been abused time and again by Sathya Sai Baba. Only a few who have become true believers can even admit this to themselves, so indoctrinated are they by his convenient (for him) talk of ‘look to yourself and leave me and my inscrutable mystery alone’. Now they believe he will survive and live into his 90s (die as he has predicted aged 92 or 96 – two contradictory prophecies!). When their trust is abused, there are many ways known to all inmates of Prashanthi Nilayam of rationalizing, explaining away, re-interpreting anything which is not as it should be with him, or simply by denying it as a fact (with quotations as their psychological defenses) I know this because for a time – too long – I participated… until I was despite myself virtually forced to recognise the ugly truth about him. Meanwhile, the politicians of Andhra Pradesh State government are flocking there not at all unlike vultures, and it is openly admitted that they want as much of the cake as they can get. Prime Minister Manmohan Singh and President Pratibha Patil are a disgrace to India in attending this degenerate who has abused devotees in many ways, including condoning their death in his bedroom. They are evidently both worshippers and seekers of all the spin-offs it gives them in votes and other connections within India. They will be remembered for it all, make no mistake. I know from contacts in London that the British Foreign Office is under no illusions about Sai Baba or them, for a start. Visiting Puttaparthi is the secretary of AP finance, MV Subrahmanyam. Regarding this,The Hindustan Times article also states: “Subrahmanyam’s presence has led to speculation that the government may be planning to take over the Sri Sathya Sai Central Trust, invoking the powers under the Hindu Religious and Charitable Endowments Act, 1959.”The government reportedly denies this, but time will show. The law to do it exists, and who will not be tempted? The many thousands of daily visitors to this website for the last month keep coming to hear what is not being told. A major campaign of enlightenment about all these revered criminals posing in monk’s robes is essential before India will gain the respect of people of stature in the world besides (and I am not talking about the Pope or his like!). 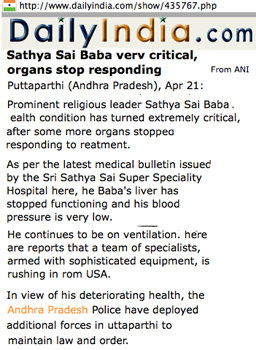 There are very strong , but unofficial and unconfirmed reports that Sai Baba died at 3.30pm yesterday India time ( wednesday…20th April )…most tv channels are reporting Sai Baba as “extremely critical”, and as ” all organs failed” and today morning’s medical bulletin has dropped the word “stable” and says “very critical”. What my source did say is that there are a few strong indicators…4000 policemen and armed personnel deployed since yesterday evening in and around Puttaparthi, senior SB trust members Indulal Shah and PN Bhagavati rushed to Puttaparthi last evening, and the sb trust has asked 1000 seva dal volunteers to immediately rush to Puttaparthi…seemingly indicating something final has happened. I also heard whispers that if at all possible, the SB trust would like to announce the event tomorrow as its Good Friday….so that the Jesus connect can be made and western devotees milked even further by turning PN into a world shrine…..meanwhile internal trust member squabbles are still at their peak…regarding who gets what, which could also be a reason an official announcement has not been made yet. As zeenews.com explains today “Sajeeva Samadhi” is the practice of burying enlightened souls while they are still alive. The report about his Samadhi gains credence as members of the Sathya Sai Central Trust held a meeting today to discuss the Trust’s affairs in the wake of the Baba’s deteriorating health.” Knowing the clandestine and deceiving methods of the Sathya Sai Central Trust and most ashram officials, no possibility can be excluded. That anyone can seriously even suggest that anyone should be buried ALIVE is so outrageous that one has to say “only in India” could this occur. The history of Indian ‘saints’, ‘godmen’ and other supposed holies apparently does actually recognize the value of such an event – the wilful interment of a living person by his own followers. That this is accepted without a public outrage in a democratic society which recognises human rights in theory, if all too poorly in practice, would amaze the world (should the world even notice it). The burial of Sai Baba will cause but a media ripple compared to the big waves that the Royal Wedding in UK is already building up. But Indian newspapers still promote the outdated idea that ‘millions of foreigners’ are devotees of Sai Baba. Perhaps there are a million of more-or-less devotees or ‘followers’, which is itself a very vague identification. To visit Sai Baba need not mean one ‘follows’ or even believes much in him, to take some interest neither so. The members of his organization abroad, though inflated purposely in every possible way, still only remains somewhere around the hundred thousand mark (see independent records). It is reported widely that thousands of police are being drafted in to cope with the flood of devotees and the disturbances that are likely to occur (having already happened recently). This indicates that plans are well advanced for the announcement of the earthly end of Sai Baba, however this is done. That doctors are being rushed from the USA makes one ask, why not far, far sooner? The amount of money expended and dozens of top doctors and massive security was wasted on this controversial and widely-accused guru, and it is disgusting when one considers how most of the poor have hardly any health care or even the vital necessities of a proper living (other than the benefit of the sun’s warmth). Since most of his organs have stopped functions (including the liver) he would be clinically dead without intensive support. Does this not surely mean that the authorities are keeping him alive until such time as they consider it meet to disconnect him from all that ‘tricknology’ (as he calls it) and pronounce that he has ascended into wherever they choose to believe? More desperate attempts at damage limitation? The attempt to save – at least in the eyes of Sathya Sai Baba believers – some kind of ‘spiritual credibility’ in events surrounding the death of the guru, it seems possible that a plan could have been devised by insiders earlier on that his death should take place on Good Friday so it might be seen by the indoctrinated to be a parallel to Jesus. The realization that he was dying does seem to have been gradually introduced, step by step, and it would not be impossible either to removed his life support on Good Friday – or in the event of his having deceased earlier, to keep him on ice (as it were) until about the time of the Crucifixion. If he dies tomorrow (Good Friday), the suspicion of manipulation will be increased. If not, we can write this off as a tentative conspiracy hypothesis which was not fulfilled! 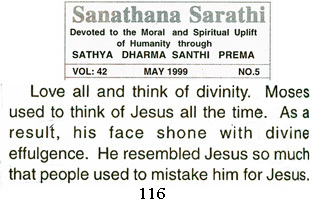 The connection between Sathya Sai Baba and Jesus was established firmly by him in a discourse in 1972, where he declared that Jesus was his son, sent by himself to carry out the Christian mission – see full proof here. There has been a relative trickle of believing Christian to Sathya Sai Baba, and nothing will serve to convince the mainstream Catholic and Protestant churches to accept Sai Baba’s preposterous claims, nor even the many warring Christian based and related sects and cults. It has hitherto had the opposite effect, if anything, and this will no doubt continue… deeply-held beliefs are very hard to change or stamp out. This will surely apply to the largely Indian following of Sai Baba, but his star is certainly not on in the ascendancy. He is unknown to billions and his name hardly ever occurs in any world media other than Indian outlets. What Sai followers simply do not understand one bit is how offensive Sai Baba’s claims about Jesus are deeply offensive to Christians (or would be had they known about them). The knife cuts both ways, for any unification of religions in this respect is entirely out of the question, despite Sai Baba’s attempts to capitalize on such an ideal. 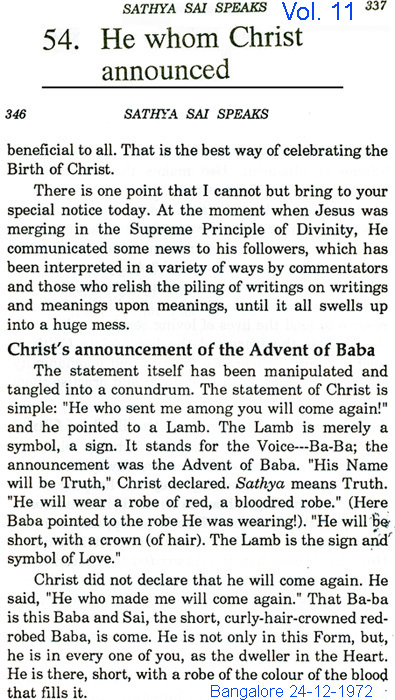 (12) Sai Baba on Moses love of Jesus!